The 19th edition of the international tournament MIC – Mediterranean International Cup of youth football, which will be celebrated during Easter in the province of Girona, has been presented this Monday in CaixaBank events-hall in Barcelona. The Argentinian manager Mauricio Pochettino, at the present training the Tottenham Hotspur FC, and the FC Barcelona player Vicky Losada attended to the event. The tournament, organized by MICSports, will take place from the day 17th to 21st of April in 35 regions of Girona, to which the new incorporations are Peralada and Vilablareix. The numbers of 2018 will be maintained, with a prevision of 900 matches and 364 teams participating from 44 countries of the whole 5 continents. Furthermore, following the dynamics of the previous years, the categories will be split and this year, the U19 will be divided on one hand into 1st and 2nd year (U18 and U17) and on the other hand the 3rd year (U19) -to encourage the competitiveness between the teams – this did already happen in the categories of U14 and U16. In total there will be nine categories, from U12 until U19 in both masculine and feminine categories of football-11, and U12 masculine of football-7. Two of the biggest protagonists of the event had been the two godfathers of this MIC’s Edition, Mauricio Pochettino and Vicky Losada. Tottenham’s coach has recognized that “he is in love with formative football” and has invited all the young players who take part in the tournament, “lucky ones”, to enjoy “this extraordinary opportunity”. Mauricio also said that “always is a pleasure to be back to Barcelona, a city that welcomed him so well 25 years ago”. Also, Vicky Losada wanted to reivindicate “how beautiful is for the younger woman players this type of tournaments”. “I want them to enjoy it and fight for her dreams because the situation of the Woman’s football is improving every year”, said the Barça’s player hours after of living “an historic day” at Wanda Metropolitano, where this past Sunday more than 60.000 fans watched live the match between Club Atlético de Madrid and FC Barcelona. Jaume Masana, the director of Catalonia from CaixaBank, has explained that MIC “fits perfectly with the sponsorship of sports strategy of the entity, as much in a strategy way, giving support to football, basketball and reduced mobility sports, as in an emotional way, identifying ourselves with the sports values such as the effort, the respect, or the team work”. “Our bound with MIC goes beyond the economic support because, throughout the dedication of our volunteers, we participate actively with the functioning of the tournament”, has pointed Masana. Finally, the director Catalunya from CaixaBank has emphasized “the compromise of the financial entity with the Girona region, which transforms into giving an impulse to initiatives like MIC, as well as, maintain a tight link with the clients due to the large number of offices of CaixaBank”. Miquel Noguer, president of Diputació de Girona, highlighted that “the 11.5 milions of euros that generated the tournament last year is an important figure”. 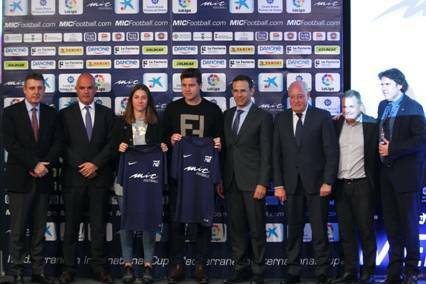 In February, Girona’s deputation and MICSports signed an agreement to ensure that MIC – Mediterranean International Cup of formative football and basket continues happening in Girona’s territory for four more years, until 2023: “We will invest more, not without a motivation, but because there are more teams. We need MIC and we bet for it”. Pere Vila, delegate of the Generalitat goverment in Girona, said that “for the Costa Brava, MIC means a lot, is very important, and it helps us to focus Easter with more people. A lot of teams can enjoy from our country. The increase of the number of participants helps us to promote MIC around the world”. 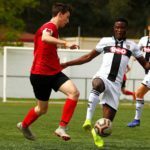 The division of the A1 – U19 category in the 19th MIC – Mediterranean International Cup will be bounded to one of the biggest novelties of this year; the VAR. The Video Assistant Referee will be used during the U19 matches played in Lloret de Mar and will be the testing platform in the formation of referees of LaLiga 1|2|3. The VAR will be introduced to second division 2019/20 and during the MICFootball will be practicing 22 referees and 44 assistants from the silver category. The TV broadcasting and streaming have been also increased for this edition and it will be possible to follow most of the tournament from almost every part of the world. First category teams are going to be presented in the tournament. An example of those are FC Barcelona, Real Madrid CF, Club Atlético de Madrid, RCD Espanyol, Manchester City FC, Manchester United FC, Tottenham Hotspur FC, Liverpool FC, París Saint-Germain FC, FC Internazionale Milano, Parma Calcio, Olympique de Marsella, FC Oporto and FC Shakhtar Donetsk. Numerous youth football teams have passed the past editions of MICFootball as well as players who nowadays are the centre of the international football panorama. This is the case of Leo Messi, Philippe Coutinho, Gerard Piqué, Sergi Busquets, Sergi Roberto and Jordi Alba (FC Barcelona), Neymar Jr (París Saint-Germain FC), Dani Carvajal, Carlos Casemiro and Sergio Reguilón (Real Madrid CF), Marcus Rashford and Juan Mata (Manchester United), Justin Kluivert (AS Roma), Alex Iwobi (Arsenal FC), Cesc Fàbregas (AS Monaco), Saúl Ñíguez (Club Atlético de Madrid), Marc Bartra (Real Betis Balompié) and Pablo Fornals (Villarreal CF), among others. MICBasketball prepares its 3rd edition, which will take place from the 18th to the 21st of April, will have a total of six categories both male and female, divided into U14, U16 and U18. In this case, there will be seven headquarters and a participation of 64 teams from 12 different countries which come from the ACB League and an international stage like the FC Barcelona, Valencia Basket, Zalgiris Kaunas, Trinta, New York Gauchos and Brainers Basketball Academy, among others. The tournament MICIntegra, destined to mental disabled people, celebrates 7 years Diverse football and basketball teams from around Catalonia will meet the 19th of April in Vidreres to compete between them. MICIntegra, which in 2018 had the participation of 23 teams, has the support of l’Obra Social “la Caixa” and the Fundació Damm and its aim is to create a space in for these people to have their own competition. MICFootball, which this year can count once again with the support of Diputació de Girona, CaixaBank and LaLiga as principal partners, continues defending the same values of its beginnings: effort, perseverance, respect and team work. The competition, which is moved by 400 volunteers, is a great opportunity for all participants to get to know other cultures and compete with the future stars of football and basketball. Moreover, it is confirmed that MICSports tournaments improve the positioning of Costa Brava as an interesting destination of Sporty Tourism and also gives it an international impulse. 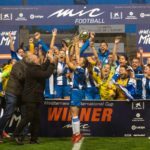 According to the study of the Economic Impact of MIC – Mediterranean International Cup 2018 ordered by the Patronat de Turisme Costa Brava Girona, MIC 2018 generated a repayment in the territory of 11,5 MEUR with a budget of 2,8MEUR. For every Euro invested by the public administration there was a payback of more than 100 Euros (125EUR when talking about football and 100EUR talking about basketball). The values which the MICFootball and MICBasketball are also captured by Premi al Periodisme Esportiu Dani Montesinos, with the wish of making a tribute to that important journalist and the goal of giving an impulse to the sports journalism and encourage young journalists. The award, propelled by MICSports with the collaboration of Mediapro, will recognise, for the 8th consecutive year, the work elaborated by a Journalism degree student who, at the same time, will obtain a practice stage in GOL TV Channel.